R.I.P. 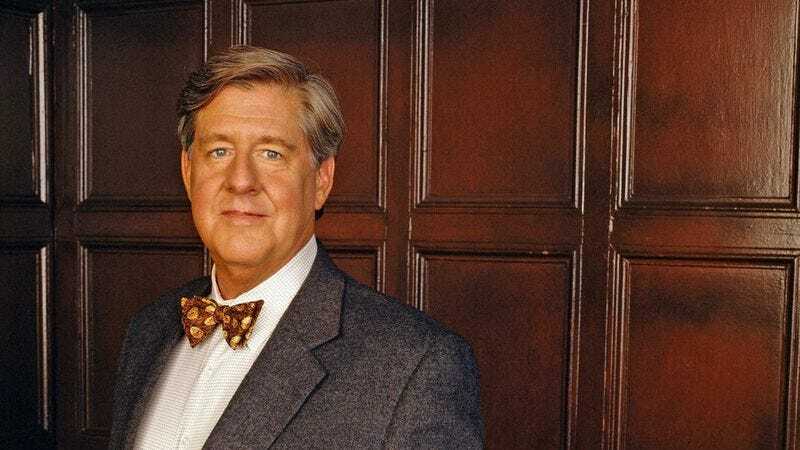 Edward Herrmann, star of Gilmore Girls and The Lost Boys, portrayer of F.D.R. Edward Herrmann, whose formidable figure made him as familiar on television and in film as his distinctive voice made him instantly recognizable as a narrator, has died at the age of 71. Per his agent, Herrmann died Wednesday at Memorial Sloan Kettering Cancer Center in New York after months of treatment for brain cancer, according to the Los Angeles Times. Herrmann’s film work soon became decidedly more substantial in rapid fashion, with the actor earning small but memorable roles in The Paper Chase, The Day Of The Dolphin, The Great Gatsby, and The Great Waldo Pepper, the stage initially continued to be where he found his most substantial success, with his performance as Frank Gardner in the 1976 Broadway revival of Mrs. Warren’s Profession earning him a Tony Award for Best Performance by a Featured Actor in a Play. His television breakthrough began the same year, when his portrayal of Franklin Delano Roosevelt—first in the 1976 TV movie Eleanor And Franklin, then its 1977 sequel, Eleanor And Franklin: The White House Years—led him to Best Actor Emmy nominations in both instances. While Herrmann hadn’t originally been interested in returning to the role of FDR, the opportunity to reprise the role in the 1982 film adaptation of the musical Annie was one he couldn’t resist (“When John Huston asks, you do it standing on your head without any clothes on just to work with him”), and 32 years later he did so yet again—albeit in voice only—for the 2014 Ken Burns documentary The Roosevelts: An Intimate History. Given his gift for gravitas, Herrmann was called upon to portray other real-life figures over the course of his career, including Lou Gehrig (A Love Affair: The Eleanor And Lou Gehrig Story), Alger Hiss (Concealed Enemies), Nelson Rockefeller (Nixon), William Randolph Hearst (The Cat’s Meow), actor Raymond Massey (James Dean), and Hollywood censor Joseph Breen (The Aviator). Although he did secure one notable leading-man role with 1981’s Harry’s War—yes, he played Harry—the majority of Herrmann’s motion picture work found him serving as a dependable character actor, capable of delivering solid, memorable performances no matter what the genre, be it historical drama (Reds), highbrow comedy (The Purple Rose Of Cairo), lowbrow comedy (Bucky Larson: Born To Be AStar), or family films (Ri¢hie Ri¢h). For many, however, Herrmann’s defining big-screen role came in 1987, when he played Dianne Wiest’s suitor, Max, in The Lost Boys. During the ’70s and ’80s, Herrmann’s television work tended to come in the form of TV movies (The Electric Grandmother) or one-off episodic roles (M*A*S*H), but while recurring roles like the one he found on St. Elsewhere as Father Joseph McCabe originally proved rare, that began to change in the ’90s. After an Emmy-winning stint on The Practice and a critically acclaimed turn on Oz, Herrmann stepped into the role that would define him for the remainder of his life: Richard Gilmore, the patriarch on Gilmore Girls. I walked in to talk to Amy [Sherman-Palladino, series creator], and I said, “You know, I’ve read a lot of these things, and this is hilarious; it’s sharp, it’s witty, and whoever you cast is gonna be lucky, because it’s great. You want me to read it?” And she said, “Yeah, if you would.” So I did, and she wanted me. And they worked out a deal where I would be recurring rather than a regular, because my little boy was 4, and I didn’t want to miss any of that. So I’d fly out, I’d stay at The Standard, they’d get me a car and I’d drive over and do my thing, and I’d go home. I didn’t realize this was a very special deal. I’ve tried to get it again and… I can’t. [Laughs.] But Amy was insistent. After Gilmore Girls wrapped its seven season run in 2007, Herrmann was rarely without work on his plate, appearing on 30 Rock, How I Met Your Mother, C.S.I., Law & Order, and The Good Wife, among others. He also continued to appear in films, with his final effort, Coach Of The Year, currently scheduled for a 2015 release. Granted, many of the films were smaller efforts, some of them even straight-to-video—stand up, please, Treasure Buddies—but Herrmann was an actor’s actor, someone for whom getting the opportunity to act was all that mattered. This was, after all, a man who happily played both FDR and Herman Munster, didn’t mind doing a voice for Tom Goes To The Mayor, and even had kind words to offer David E. Kelley’s much-maligned Wonder Woman pilot. He could even pull off referring to Esther Williams as “a real dish” and refer to himself as having been once seen as “the bee’s knees.” There aren’t many men left who can still manage that feat, and now, sadly, there’s even one less.